Recent experimental and computational studies have shown that transmurally heterogeneous material properties through the arterial wall are critical to understanding the heterogeneous expressions of constituent degrading molecules. Given that expression of such molecules is thought to be intimately linked to local magnitudes of stress, modelling the transmural stress distribution is critical to understanding arterial adaption during disease. The aim of this study was to develop an arterial growth and remodelling framework that can incorporate both transmurally heterogeneous constituent distributions and residual stresses, into a 3-D finite element model. As an illustrative example, we model the development of a fusiform aneurysm and investigate the effects of elastinous and collagenous heterogeneities on the stress distribution during evolution. It is observed that the adaptive processes of growth and remodelling exhibit transmural variations. For physiological heterogeneous constituent distributions, a stress peak appears in the media towards the intima, and a stress plateau occurs towards the adventitia. These features can be primarily attributed to the underlying heterogeneity of elastinous constituents. During arterial adaption, the collagen strain is regulated to remain in its homoeostatic level; consequently, the partial stress of collagen has less influence on the total stress than the elastin. However, following significant elastin degradation, collagen plays the dominant role for the transmural stress profile and a marked stress peak occurs towards the adventitia. 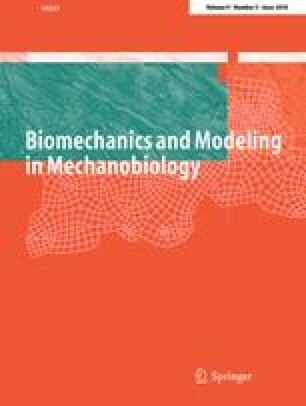 We conclude that to improve our understanding of the arterial adaption and the aetiology of arterial disease, there is a need to: quantify transmural constituent distributions during histopathological examinations, understand and model the role of the evolving transmural stress distribution.